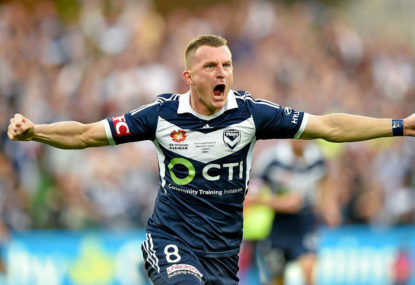 Don’t ever question Besart Berisha. The A-League legend scored an outrageous winner when his team needed him most to set up two classic semi-finals. 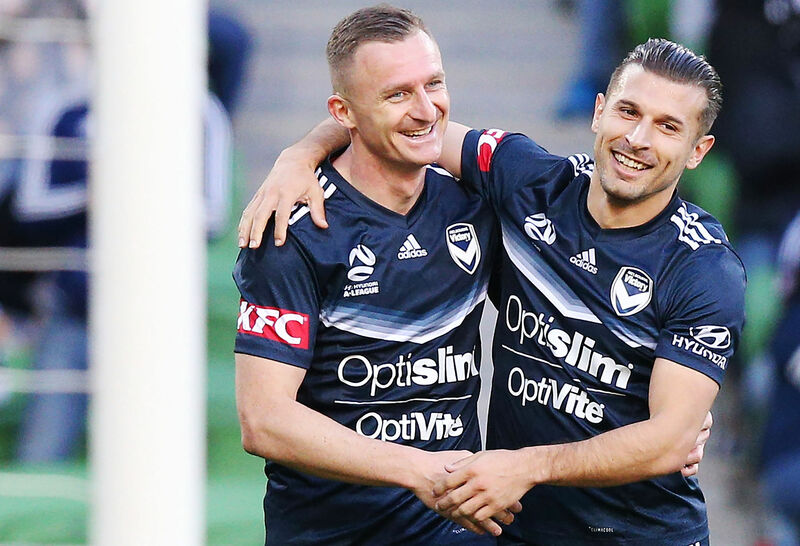 Just when you thought it was all over for Berisha, who has been out of sorts all season and was on the verge of being substituted last night, he goes and pulls you back in. Or more specifically, he pulls Melbourne Victory into a mouth-watering semi-final showdown with Sydney FC at Allianz Stadium next Saturday night. And his goal was one of the most spectacular in A-League finals history. In truth, Berisha has been a shadow of his former self for much of the campaign, and it looked like that streak would continue on another quiet night for the Kosovo international. But when Kosta Barbarouses floated a ball towards the six-yard box, it just had to be Berisha to convert with an outrageous bicycle kick. And didn’t the Victory fans celebrate it in style? They may be unloved by fans of the other nine A-League clubs, but it’s hard to argue that Victory supporters don’t produce the best atmosphere in the competition. And they had AAMI Park positively thrumming on Sunday evening – even if high ticket prices kept some fans away. Sunday’s clash with Adelaide United was a slow burn to start, but by the time Nikola Mileusnic burst through from a quickly-taken free-kick, Victory knew they were in for a fight. It was their most effective player this season in Leroy George who headed them back into the contest, but plenty of credit should also go to Barbarouses – who finished the game with two vital assists. And if Victory lose George in the off-season because of salary cap constraints, questions must be asked of what Football Federation Australia plans to do to help keep such exciting attacking talents in the A-League. As it stands, Victory march on to a semi-final showdown with their bitter rivals Sydney FC in front of what should be a big crowd at Allianz Stadium. And Melbourne City travel to the Hunter to take on the Newcastle Jets at what will be a packed McDonald Jones Stadium. City were ruthlessly efficient in dispatching Brisbane Roar 2-0 on Friday night, as individual errors came back to haunt John Aloisi’s team. Roar defender Jack Hingert should have simply cleared the ball just before the hour mark, only to attempt to turn out of danger and lose possession to Bruno Fornaroli. The Uruguayan them ambled into the box to tee up Stefan Mauk to produce an excellent finish, and in truth it was no less than a dominant City deserved. Hingert could have redeemed himself when he scuffed a shot wide soon after, before Nick Fitzgerald’s powerful header ended the game as contest as City booked their third semi-final appearance in four years. And what an intriguing clash it will be against a Newcastle side that finished the season with three defeats from its last four games. Will that be enough to dampen spirits in the Hunter? Of course not. 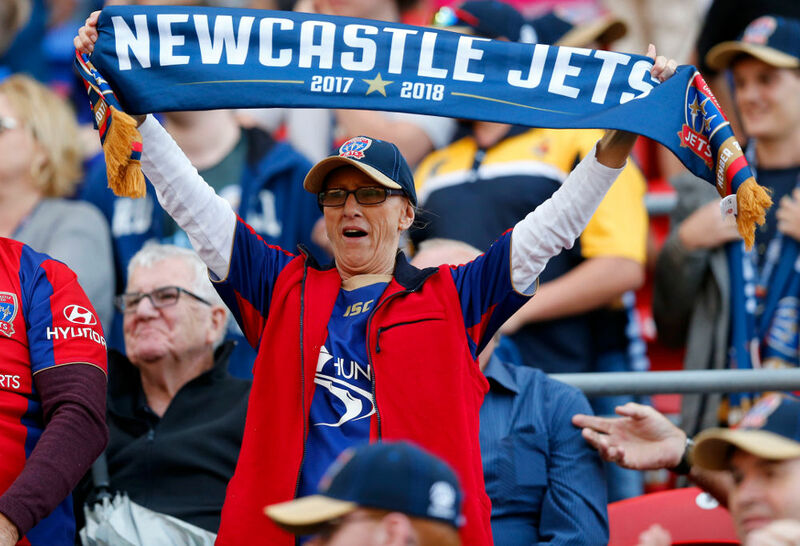 Tickets are flying out the door for Friday night’s semi-final, with the Jets making their first return to the finals series since the 2009-10 season. And the clash between one of the A-League’s genuine battlers and the nouveau riche of City makes for a fascinating subplot. It’s just a shame there weren’t a few more fans in attendance this weekend – and yet again FFA deserve a spotlight shone on their decision-making. When the elimination finals could have been played out against the backdrop of heaving stands, the high cost of many the tickets on offer no doubt saw plenty of fans opt to stay home and watch on TV instead. Here’s hoping the ratings on Fox Sports and One were decent. And we’re fortunate the football was something to write home about as well. These are the semi-finals the A-League had to have, and they can’t come quickly enough.